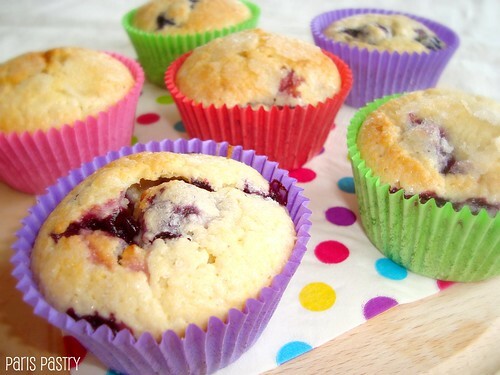 "Nothing makes a cheerful morning like the smell of fresh muffins baking in the kitchen." And nothing makes a morning even more cheerful than eating them! I take the greatest joy in making the simplest baked goods. Muffins would go straight to the top of that list. I can't possibly think of anything to bake - or cook, for that matter - that takes as little effort as making muffins. I mean, you don't even use a mixer. The batter needs to be lumpy. The blueberries need to poke out and leak. And the muffins need to look homemade :) Rating: 4- out of 5. Ingredients: The book says makes 12, but I used half the recipe and still got 11. - Preheat oven to 350 degrees F. Grease well a 12 cup muffin pan. - In a large bowl, mix together the dry ingredients, making a well in the center. Stir in the liquid ingredients until just combined, being careful not to overmix. Batter may be lumpy. 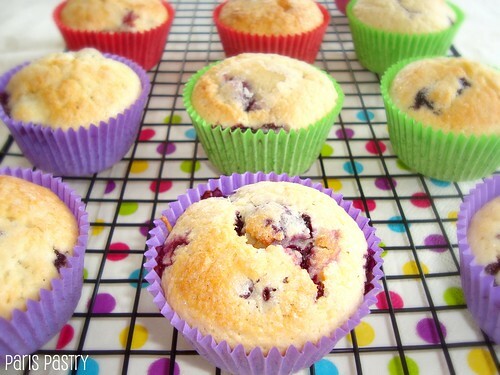 Gently fold in the blueberries into the batter. - Fill the muffin cups about three-quarters full. Lightly sprinkle with the remaining 1 tablespoon of sugar. - Bake for 20 - 22 minutes until lightly golden or a cake taster inserted into center of muffin comes out with moist crumbs attached. Do not overbake. without any addition. How do you prefer your muffins? There is a cafe in the bottom of my office building, and every once in a while I treat myself to a blueberry muffin that they have just removed from the oven. Mmmm... Those are my favorite work days!! So simple, yet so incredibly good! A good cup of coffee, freshly baked county style blueberry muffins with cold butter, a recipe for a perfect morning!